Nezu Jinja lies in Tokyo’s Bunkyō ward, and has since Shogun Tokugawa Tsunayoshi ordered the shine moved to its current location in 1705. The shrine is perhaps best known for its extensive azalea garden, which erupt in color every April (there’s even an azalea festival at the shrine each spring), but I visited for the first time last December and can attest it’s worth a visit in any season. 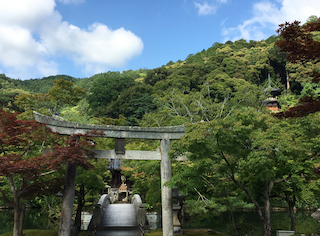 Today we continue the virtual tour of Hakone Shrine with a trip to the water gate. In the Shintō faith, torii (the red-orange gate in the images) mark the boundary between the secular and the sacred – though on occasion, it often seems that the areas on both sides of the torii are equally sacred. The water gate at Hakone Shrine is one of those places. (To read this series from the beginning, click here!) Hakone Shrine sits on the shore of Lake Ashi, in a grove of massive, sacred trees. The scents of pine and cedar follow visitors up the shaded paths. In winter months you may also catch a whiff of wood smoke in the air. After visiting the purification fountain, most visitors either head down to the water gate on the shore of Lake Ashi or up the steps to the shrine’s main worship hall. Hakone Jinja (Hakone Shrine) sits on the shore of Lake Ashi (Ashinoko) in Hakone, Kanagawa Prefecture – about an hour’s journey south of Tokyo. Its giant lakeside torii makes it among the most picturesque Shintō shrines, as well as an important historical, tourist, and religious site.